After the ninth Bond picture “The Man With The Golden Gun” hit cinema screens in 1974 with a lackluster response, Bond producers turned their attention immediately to the to question, “what’s next?” The tenth picture would be the biggest step up for 007 since the immense success of “Goldfinger” with the double the production budget of its predecessor and double the effort to produce an epic picture. Three time Bond director Guy Hamilton was invited to direct "The Spy Who Loved Me", but while the producers searched for a writer with the imagination and flare to pen a Bond picture, co-producer Harry Saltzman ran into financial trouble. Other less successful ventures had left Harry Saltzman in debt. Attempting to finance multiple productions and other personal projects had lead Saltzman to massive loans with the Swiss banks – and up as collateral were his shares in Eon Productions. When Saltzman’s colleagues discovered his immense debt many threw themselves into the battle to try and save him from bankruptcy. To top off his troubles, Saltzman’s wife had fallen seriously ill suffering from cancer. Friends and family tried to find a solution but in the end Saltzman had no choice but to relinquish his Bond right. Several businessmen showed immediate interest in the highly successful franchise, but it was important to Saltzman and Broccoli that 007 did not fall into the wrong hands. For a time Eon Productions was closed for business while Saltzman declared bankruptcy and was forced to turn over his shares of James Bond – leaving Albert R. “Cubby” Broccoli the primary shareholder in Eon productions and the James Bond film rights. From then on in, the fate of 007 laid in Broccoli’s hands alone. Due to an agreement with the Fleming estate, Broccoli held the rights to no more than the title of “The Spy Who Loved Me” – and so the story had to be concocted from scratch. The hunt was on far and wide and authors and movie buffs alike were all considered for the writing job. Anthony Burgess (author, “The Clockwork Orange”) was one of those keen to lend his style to Bond but at the recommendation of MGM, John Landis was invited to work with Guy Hamilton on developing the “Spy” script. 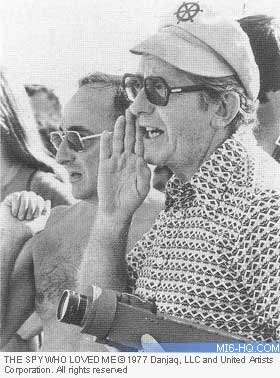 Ultimately, the stress of deadlines and a few creative differences lead Guy Hamilton to bow out of the production, and with him went Landis. Without a screenwriter, director, or useable script, Broccoli turned to friend and old Bond hand Lewis Gilbert to bring the production back on track. Gilbert, who previously directed "You Only Live Twice", accepted the challenge and quickly set about finding a plot for Bond #10. The creative team, including a young Michael G. Wilson, concocted the concept of a supertanker that swallows up submarines. Gilbert recommended Christopher Wood to piece together the screenplay. Both Wood and Gilbert were Fleming fans and so the decision was made to make Bond less like Sean Connery, but more like the literary character – very English, suave, snobbish, and... humorous. With Wood trusted with the screenplay, Gilbert went location scouting. Welcome To Japan, Mr Bond? With much of the production team assembled, including regular production designer Ken Adam, the crew began the massive task of location scouting. Gilbert had heard of an underwater “city” being developed in Tokyo and for a while considered sending Bond Far East, as he did in “You Only Live Twice”. As it happened, the underwater Atlantis is written in but instead of Japan, Egypt and Sardinia become key locations in the final draft. With the script approved by Broccoli, the team searched for one final piece of adventure – the pre-title sequence! Legendary among Bond fans, the “ski-parachute jump” has become synonymous with 007 and “Spy”. Michael G. Wilson saw a piece with Rick Sylvester and he approached the stuntman about performing his signature trick on film. Sylvester agreed to jump, for a mammoth sum, but ‘fessed up to the crew, admitting that he had never successfully completed the stunt. Nevertheless, Sylvester displayed all the confidence the Bond producers needed to hire the stuntman. Thus, the Austrian Alps is added to the ever-growing list of “The Spy Who Loved Me” locations. Test footage was shot in the Artic circle and John Glen and his second unit team were given the go-ahead to film the pre-title sequence, provided they get it done long before the film’s 1st unit shooting schedule. The 2nd unit crew arrived in Austria with Rick Sylvester in tow, but a storm prevented shooting for almost a week. When the days were finally clear and Rick was ready to jump, four cameras – including a helicopter camera –covered the feat. The crew knew it was to be a one-shot-wonder and no amount of rehearsing could prepare for the real thing. Of all the cameras covering the event, only one caught the complete jump. This shot is the shot that appears in the final film. Back home, Broccoli and Gilbert turned their attention to the supporting cast. Charles Juroe of Eon’s marketing department recommended Curt Jurgens for the villainous role of Stromberg. 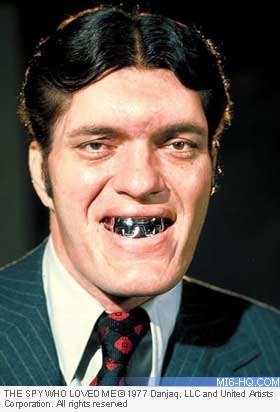 For his infamous henchman, the team was inspired by Fleming’s character, Horror – who, like Jaws, had menacing silver-planted teeth. Richard Kiel was an obvious choice for his sheer stature and menace and lives on in fan’s memories as the classic Bond henchman. Bond girls were scouted for all across the globe but the standout act always wins the lead. Producers had looked far and wide to find a lady worthy to play Bond's equal. 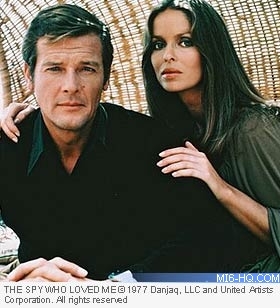 For “The Spy Who Loved Me”, and Barbara Bach was cast as 007’s Russian ally, Anya Amasova. In the role, Bach must match up to Bond’s wit and prove herself the Bond girl to rival all Bond girls. Casting Bach was a last minute panic and she was tested and signed a mere 4 day period before shooting was due to start. Cameras began to roll at Pinewood on 31st August 1976 in the office of General Gogol, and continued in to M’s office scenes. Two weeks later, on 15th August, the production traveled to Sardinia where Gilbert shot the first of his many scenes with Richard Kiel – his towering henchman. The brand new Lotus Esprit gave a memorable performance in “The Spy Who Loved Me” during its scenes in Sardinia. Only two cars of its type in the world were available, and so the production had to requisition the Esprit from Colin Chapman, the head of the Lotus Company. Chapman’s car performs some of the Lotus’ stunts in the final cut. Back at Pinewood, the stunt crew prepared the various hand-to-hand fights in the film, including a nod to “From Russia With Love” in which Bond battles Jaws in a grueling train fight. 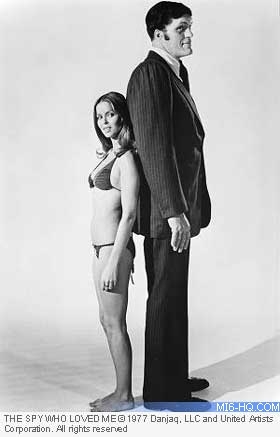 Despite being less than six foot, veteran stunt man Bob Simmons successfully doubled for seven foot Richard Kiel for the sequences. In the final seconds of the sequence Simmons plunged himself through a plate glass window, with nothing but his forehead to smash the glass. 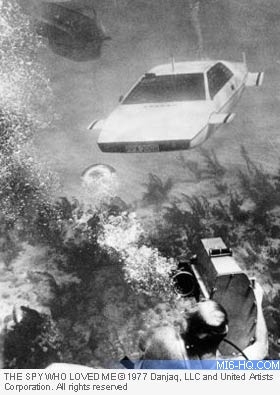 The second unit journeyed to the Bahamas set and shot the underwater scenes of both the Lotus and the giant lair Atlantis. Derek Meddings took charge of fitting out several models of the Lotus to shoot the car-sub transformation. In the end, seven different models of the Esprit were used in the film. Meanwhile, across the oceans, the first unit traveled to Egypt. The crew tried and failed to light the pyramids for Bond’s encounter with Jaws and Anya. Resigned to the fact that they could only shoot close-ups on location, the production team made a call to Alan Maley, a Hollywood recognized visual effects artist. Maley and his team would fill in the blanks – making the pyramids glow. 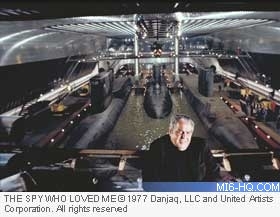 Shooting the climax of “The Spy Who Loved Me” posed problems for both the production crew and the second unit. Originally, the script called for Bond to battle Stromberg’s goons on the decks of his massive super-tanker, but problems arose. The use of a Shell supertanker would be free to the production – but the insurance for both the tanker and its crew stacked up to be over $60,000 per day. A new scheme was formulated. A combination of lavish interior design from Ken Adam and lifelike miniatures from resident model maker Derek Meddings lends to this impressive sequence. Shooting the interior of the massive supertanker (large enough to comfortably hold three two-third scale nuclear submarines) needed a studio space that simply did not exist. The production searched for hangers or warehouses that might be large enough, but without success. Cubby Broccoli made the call to construct a soundstage large enough to accommodate the set Ken Adam was to design. Ken Adam came up with a crafty solution to build the set as they built the soundstage. 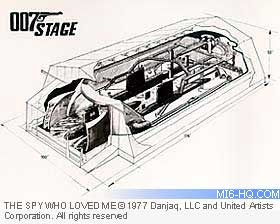 It was soon adopted and the plans for both Adam’s set and the “007 Stage” are laid down. While Ken Adam worried about the style and interest of the set, the producers worried about their shooting schedule. With just 17 weeks before Lewis Gilbert was due to roll cameras on the sequence, only the first foundations were laid. The 007 Stage required a mammoth effort from all involved to get the building and the Liparus set completed. On 5th December 1976, the official opening for Europe’s largest soundstage was held. The set was a triumph, and completed in perfect time!